With clean lines and smart styling, this compact kids’ ride-on tractor is ready for dirty work. Young farmers will be itching to get off on their rounds with this lovingly detailed kids’ ride-on tractor. Far more than a toy, the Toylander Tractor MFR recreates all the features of the Massey Ferguson 135®in a rugged package with speeds of up to 5mph/8kph. Farmyard play has never felt so real, thanks to the tough monocoque body and a spec that includes forward/reverse gears, speed control, foot brake, hand brake, lights, tow bar, 25:1 ratio gearbox, real agricultural tyres on steel rims, front swing axle and horn. If you like a challenging project and prefer complete control over choosing your parts, you can buy our comprehensive build manual. It has all the information you’ll need to build your Toylander from scratch, including full cutting details and dimensions for body panels and component parts. If you’d like to buy your parts from us, we stock everything you need to complete your build (excluding pre-cut panels). 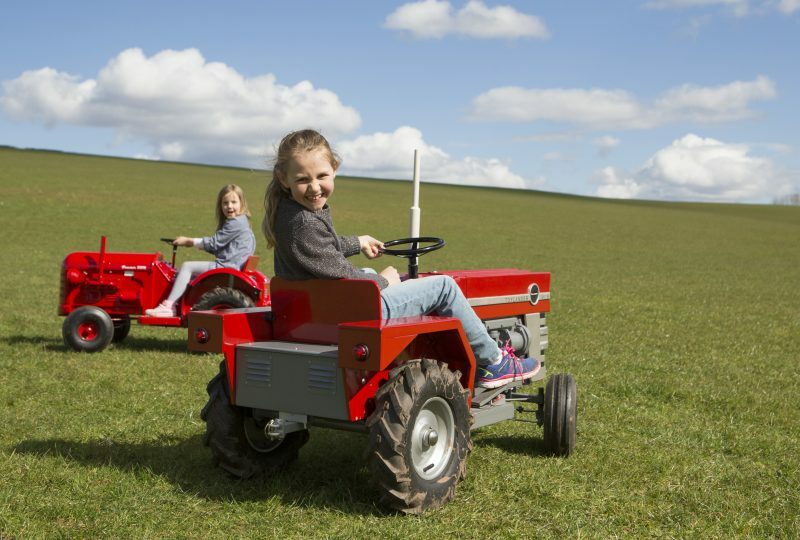 Superior quality electric tractors that children love to drive.